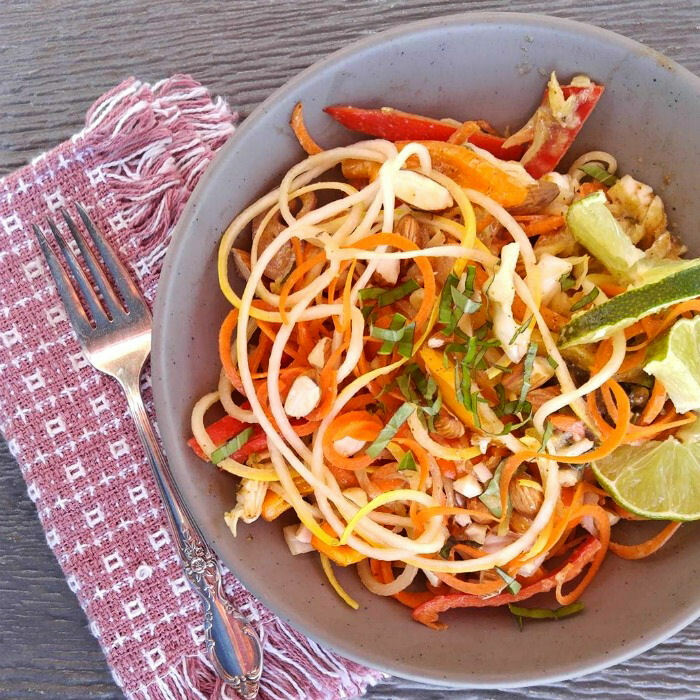 This delicious Asian Zucchini Noodle Salad is a wonderful mixture of zucchini, cabbage, carrots, sweet bell peppers, and shallots, tossed with a spicy almond butter dressing. It’s light, fresh, and super easy to make! If you are looking for a healthy meal for lunch time, you can’t go wrong with this one! Yummy, creamy stick to your noodles sauce…whoopsie…just remembered that I’m trying to eat a clean Paleo diet. But that won’t stop me from indulging in one of my favorite meals. It’s time for one of my food substitutes. 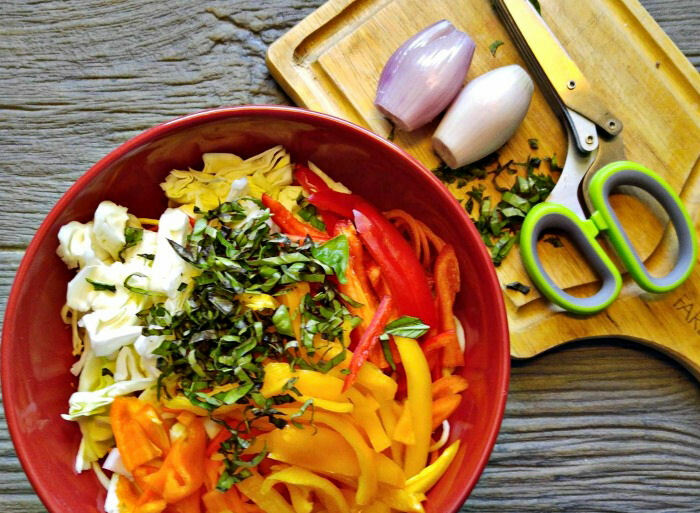 Have you used a spiralizer yet? This amazing tool is the perfect kitchen gadget for those who are trying to follow a clean eating plan. A spiralizer turns ordinary vegetables into long noodle shapes that are just perfect for tossing with your favorite home made dressings. Save the calories of high carb noodles by turning vegetables into “zoodles”. I love making clean eating salads for lunchtime. This recipe is super quick and easy to make. All you need to do is spiralize your zucchini and carrots, chop up the other veggies and make the home made dressing in a bowl. It’s ready in less than 15 minutes but rivals any trendy café salad. I have a fresh basil in a pot on my deck garden and decided to add a big bunch of it to this salad. Nothing tastes better than home grown herbs in a salad. 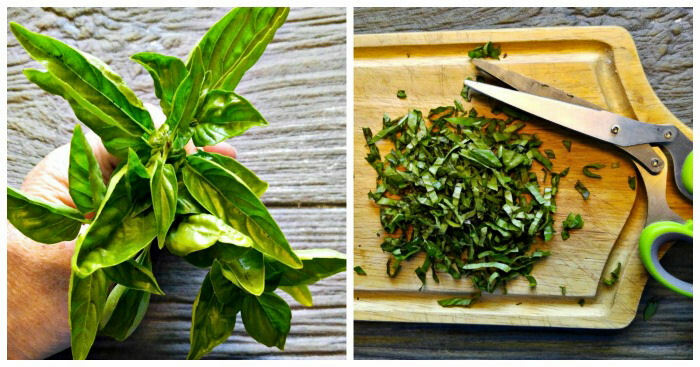 My herb scissors makes mincing the basil to just the right size a cinch! Start by spiralizing the carrots and zucchini. 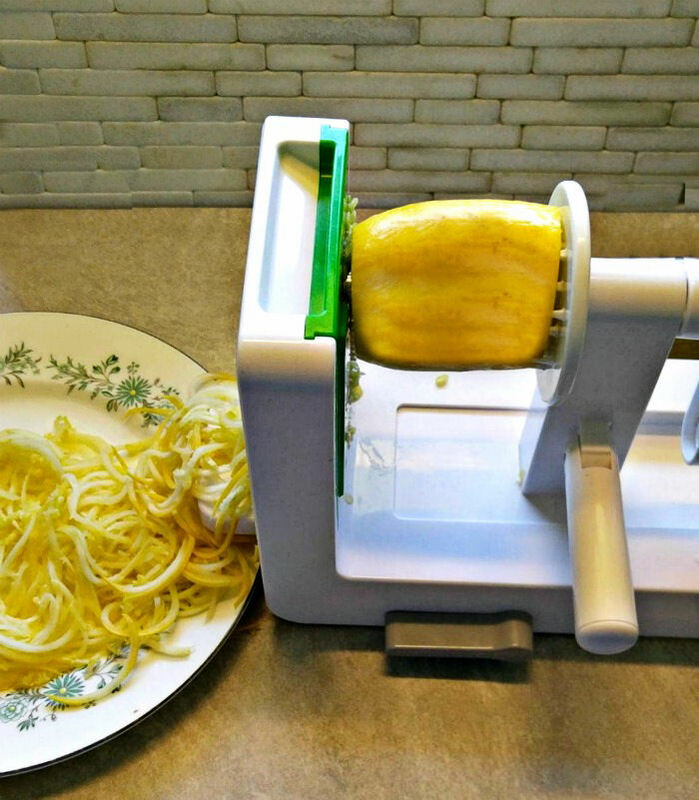 There is something oddly relaxing about using a spiralizer. I look for other ways to use it every time I give it a go! The dressing is a cinch to make. Just combine all the ingredients and give it a quick swirl in a blender or food processor. Tada! It’s done! You will notice that the dressing is thicker than you might expect. That is because zucchini has a high water content and sweats when you make it into noodles. Don’t worry. This is normal and the thick dressing will combine with the noodles to make a perfect consistency to your salad! 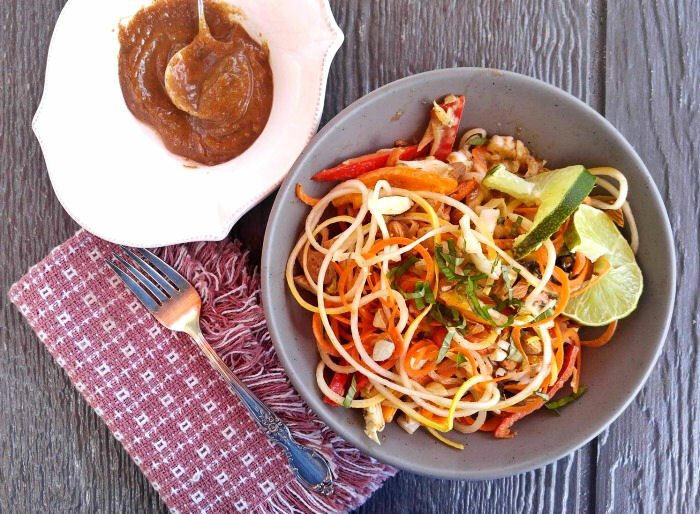 Just pour the creamy almond butter dressing over your Asian zucchini noodle salad and give it all a good toss. Garnish with lime juice to add a bit of extra moisture and some extra chopped basil I also tossed on a few chopped almonds for crunch. This Asian Zucchini Salad is creamy, spicy and tart with the delicious taste of fresh vegetables. I love the way the dressing coats the “zoodles” just perfectly! It is savory and tangy, creamy and nutty. 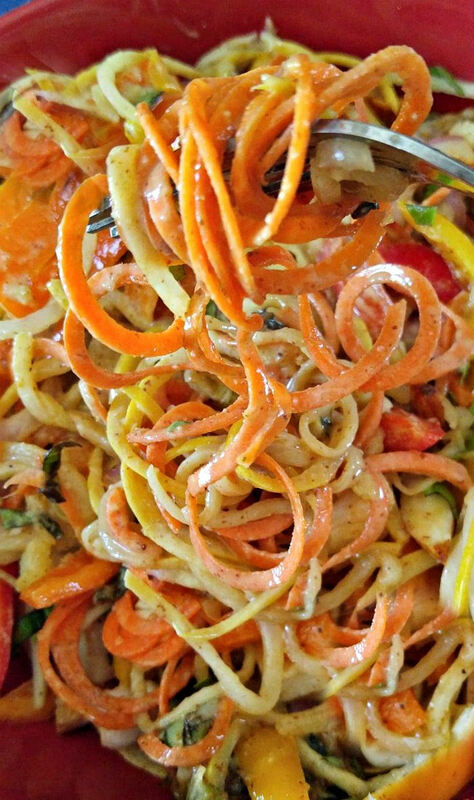 Just a perfect combination of flavors that go wonderfully with the spiralized vegetables. This salad makes the perfect clean eating meal. It has no gluten, is dairy free, and fits into a Paleo or Whole30 diet plan. And did I mention how great it tastes? YUM! Enjoy!! 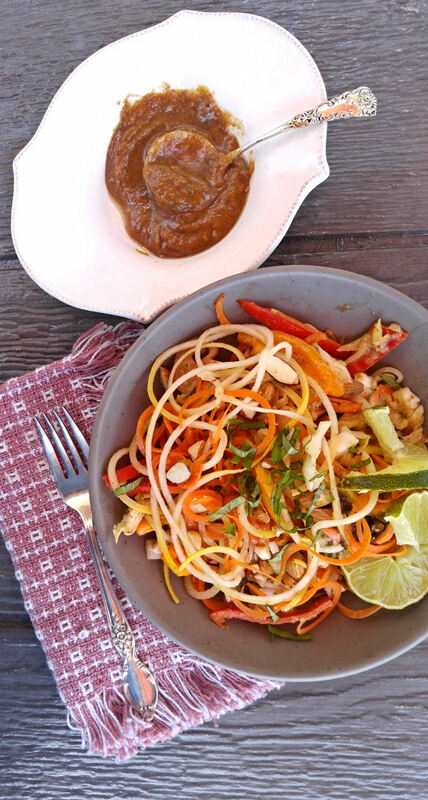 This delicious Asian Zucchini Noodle Salad is a wonderful mixture of zucchini, cabbage, carrots, sweet bell peppers, and shallots, tossed with a spicy almond butter dressing. 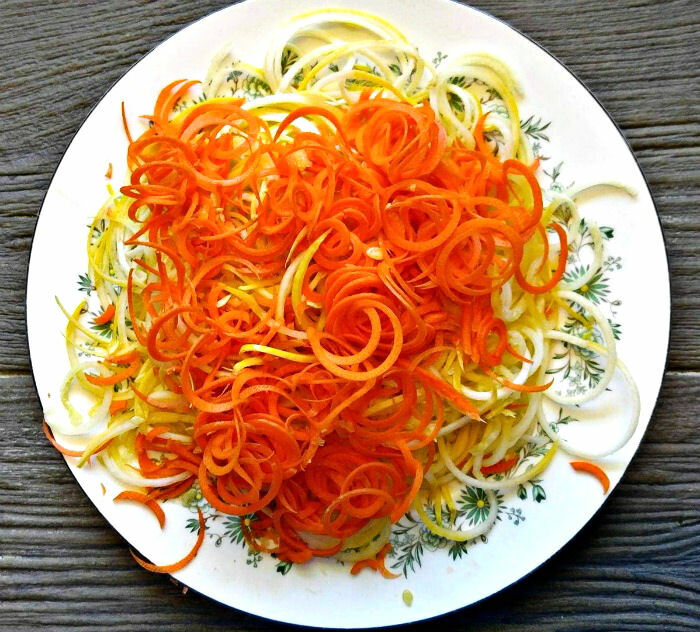 Cut the zucchini and carrots into noodle shapes using a spiralizer. Place in a large bowl. Add the red cabbage, sweet peppers, shallots and basil. Toss lightly and set aside. 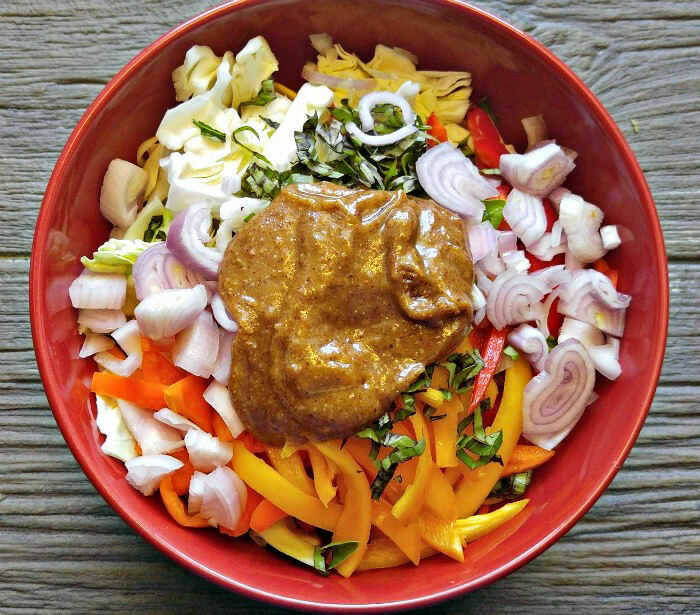 In a food processor or blender, combine together the dressing ingredients. The mixture will be thick but since "zoodles" will sweat a little, you'll end up with the perfect consistency. Toss the dressing with the zoodles mixture. Garnish with extra basil and lime wedges. Will keep for two days in a sealed container in the fridge.